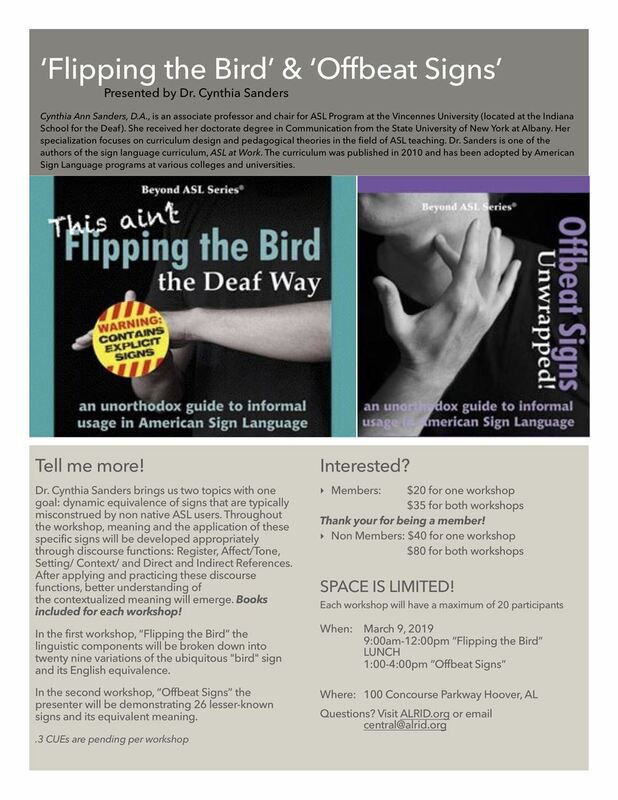 Alabama Registry of Interpreters for the Deaf - "Flipping the Bird" and "Offbeat Signs"
"Flipping the Bird" and "Offbeat Signs"
ALRID Members wishing to attend BOTH workshops. ALRID Members wishing to attend the "Flipping the Bird" workshop only. This workshop will be the morning session from 9:00am-12:00pm. ALRID Members wishing to attend the "Flipping the Bird" workshop only. This workshop will be the afternoon session from 1:00pm-4:00pm. Non-Members of ALRID wishing to attend the "Flipping the Bird" Workshop. This workshop will be the morning session from 9:00am-12:00pm. Non-Members of ALRID wishing to attend the "Offbeat Signs" workshop. This workshop will be held as the afternoon session from 1:00pm-4:00pm. Those who are not members of ALRID wishing to attend both workshops. Dr. Cynthia Sanders brings us two topics with one goal: dynamic equivalence of signs that are typically misconstrued by non native ASL users. Throughout the workshop, meaning and the application of these specific signs will be developed appropriately through discourse functions: Register, Affect/Tone, Setting/ Context/ and Direct and Indirect References. After applying and practicing these discourse functions, better understanding of the contextualized meaning will emerge. Books included for each workshop! In the first workshop, “Flipping the Bird” the linguistic components will be broken down into twenty nine variations of the ubiquitous "bird" sign and its English equivalence. In the second workshop, “Offbeat Signs” the presenter will be demonstrating 26 lesser-known signs and its equivalent meaning. .3 CUEs are pending per workshop. Space is limited to 20 participants per workshop! Register today to ensure your spot! Onsite registration will not be available. Registration form can be printed HERE.